Historian H.W. Brands once again visited Grand Rapids, Michigan, this time to present his lecture “The Golden Age of the Senate”. The presentation is a prelude to his upcoming book Heirs of the Founders which will be available November 2018. Brands, a University of Texas at Austin Professor of History and Government, focused his remarks on the three most noted members of Congress during the first half of the nineteenth century: John C. Calhoun of South Carolina, Henry Clay of Kentucky, and Daniel Webster of Massachusetts. Brands believed that these three Senators were the ‘rock-stars’ of their day, as they were in fact more well known, and since better remembered, than many of the U.S Presidents during the 1800s. Regarding the U.S Constitution, Brands highlights that the Presidency, as mentioned, was not meant to be the driving force of the American government, but in fact it was the Congress as they were the representatives of the people. This derived from the Founding Fathers belief that members of Congress should direct our American democracy. Calhoun, Clay, and Webster would shift American policies for decades, from moving the U.S. towards the War of 1812 with England through the Compromise of 1850, which was on the pathway to the Civil War. He touched on their backgrounds and their determination to be President, all while crafting their image and accomplishments in Congress. 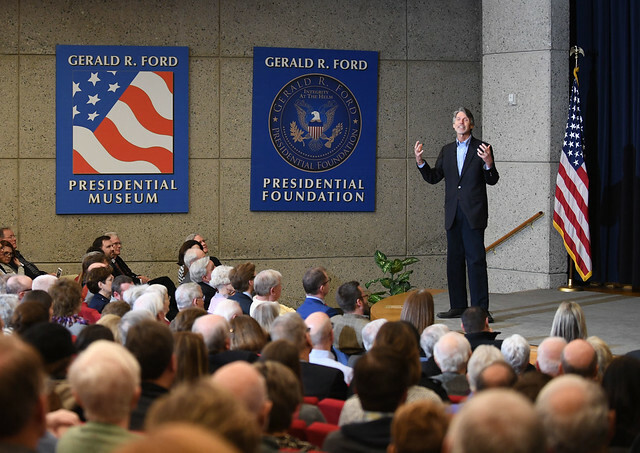 The lecture was in partnership with the Gerald R. Ford Presidential Foundation & Museum, and Grand Valley State University’s Hauenstein Center for Presidential Studies. Gerald R. Ford Presidential Foundation Executive Director Joseph Calvaruso, who also serves on the Michigan Historical Commission, announced that Col. Ralph Haunstein was the 2018 MAK Award Recipient. Brian Hauenstein remarked following the award presentation on behalf of his grandfather and their family. The purpose of the William G. Milliken/Elizabeth S. Adams/Frank J. Kelley Award is to recognize significant contributions to the preservation, understanding and/or promotion of Michigan’s history by individuals through lengthy and/or visionary service.